Right. So I'm an award-winning publishing veteran who's worked as an in-house editor of both commercial fiction (at Harlequin Books) and literary fiction (at McGraw-Hill Ryerson, where I acquired and edited short fiction for teens by such luminaries as Teresa Toten and Patrick DeWitt). I'm also a multi-published author—of two romance novels and two young adult novels. 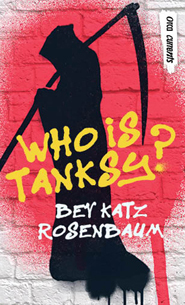 And I've just sold a fun middle grade novel called Who is Tanksy? to Orca's 'Currents' line. (An anonymous, anti-authoritarian graffiti artist! A middle school election not unlike a certain recent American election! You'll laugh! You'll cry!) And I might have picture book news to announce soon, and I'm also working on a novel for young adults that's very dear to my heart. Other writing-related experience: I was a staff writer on a television show geared to tweens, and I've taught romance writing at George Brown College and children's writing at Centennial College. When I'm not writing or freelance editing (see my Editing Services page), I'm guzzling coffee, eating chocolate, binge-watching TV, catching up on friends' books, exploring my city (Toronto), dancing (all kinds) and hiking. Not the extreme kind. The mildly challenging and occasionally inspirational kind. Home/About Me | Who Is Tanksy? | Free Books! | Editing Services | Newsletter | School Visits | Bev's Writing Workshops (in Toronto) | So You Want to Write for Kids… | Contact :: Graphics and site design by Glass Slipper WebDesign. All content including graphics copyright Bev Katz Rosenbaum.